A deputy editor at an Australian magazine claims he was fired after he blew the whistle on pressure from Rockstar to write a positive review for the upcoming Red Dead Redemption. 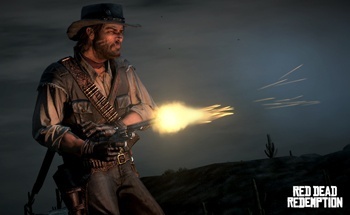 Toby McCasker was a deputy editor at Australian magazine Zoo Weekly and apparently handling its review of the upcoming Red Dead Redemption when he posted part of an email sent to the mag, allegedly from Rockstar, on Facebook. "This is the biggest game we've done since GTA IV, and is already receiving Game of the Year 2010 nominations from specialists all around the world," the email said. "Can you please ensure Toby's article reflects this - he needs to respect the huge achievement he's writing about here." Shortly thereafter, McCasker was fired, because, he claimed, he refused to play along with Rockstar's demands. "I did not sign up to become a journalist to write advertorials masquerading as editorial," he told News.com.au. "This 'cash for comment' culture that is fast becoming the status quo within print media bothers me a lot." The email he posted has since been removed and Rockstar seems to be positioning itself somewhere between ignorance and denial that it did anything wrong in the first place. "We are not clear on what the story is here," the company said. "We always try to present our games in the most compelling way to media and fans alike and of course we, like every other video game publisher in Australia or anywhere else for that matter, want to have our games seen in a positive light." As for the magazine's itself, Zoo editor Paul Merrill dropped a line to Kotaku denying that Rockstar has ever pushed for preferential treatment and he had a few harsh words for McCasker as well. "I would like to make it clear that at no time has Rockstar EVER sought a preferential review in return for advertising. In fact no games company has ever suggested this. And Zoo would never give a positive review to a game we didn't rate in return for ad dollars," Merrill said. "Toby McCasker was sacked for a number of reasons, one of which was his decision to post a private email on his Facebook page," he continued. "This email was not referring to a game review. He should not be considered a credible source of information on this matter." This wouldn't be the first time a game publisher pushed the press for positive coverage of a new game, nor the first time an editor found himself looking for a new job for refusing to go along with it. On the other hand, posting a private, business-related email on Facebook, regardless of the content, isn't exactly a smart career move; furthermore, according to the report, "McCasker had earlier received two official warnings about his behaviour." It sounds like it may be awhile before this one gets straightened out.